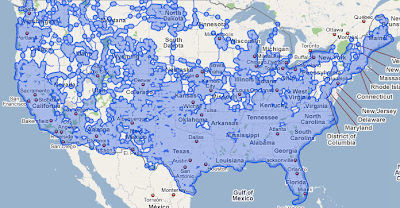 According to the Google Lat Long Blog Google has doubled the coverage of Street View imagery in the United Sates. Street View will now feature coverage in some new cities like Memphis, Birmingham, and Charleston (SC), and a few new states like Maine, West Virginia, North Dakota, and South Dakota. From the images posted on today's post at the Official Google Blog it looks like they've filled in lots of gaps across the country. The Google Street View team has had a busy year. Earlier this year they launched Street View internationally with the imagery of the Tour de France route. Street View now features seven countries including France, Japan, Australia, Spain, Italy, New Zealand, and of course the U.S. With Street View's international sites you can get a birds eye view of some of the world's most famous attractions and landmarks, from the Eiffel Tower to Shibuya, Tokyo to the Pantheon. Google says between today's launch and all the other launches this year, 2008 saw a 22-fold increase in the amount of Street View imagery available around the world.